Japan is a shopping paradise. Almost everything one can imagine, already exists here. From the most traditional costumes of Japanese culture, to the latest technology or the strangest gadgets on the market. Many of the revolutionary products come from this country and, although in many articles the prices are not very cheap, others can be much cheaper. The quality of its products is very good and its consumerist desire will make almost all stores open any day of the week. The chain shops named 100 Yen are some of the most frequented by travellers. They can be found in most cities and, in addition to their price, their wide variety is striking. In Tokyo one of the most frequented commercial areas is Akihabara, the commercial area where most of the electronic products can be found; also Shibuya, where you will find shopping centers and a variety of clothing stores. 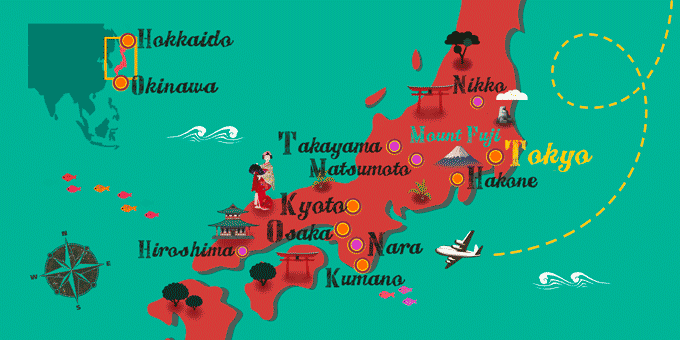 To buy crafts, teas or traditional Japanese costumes, Kyoto is one of the best cities.